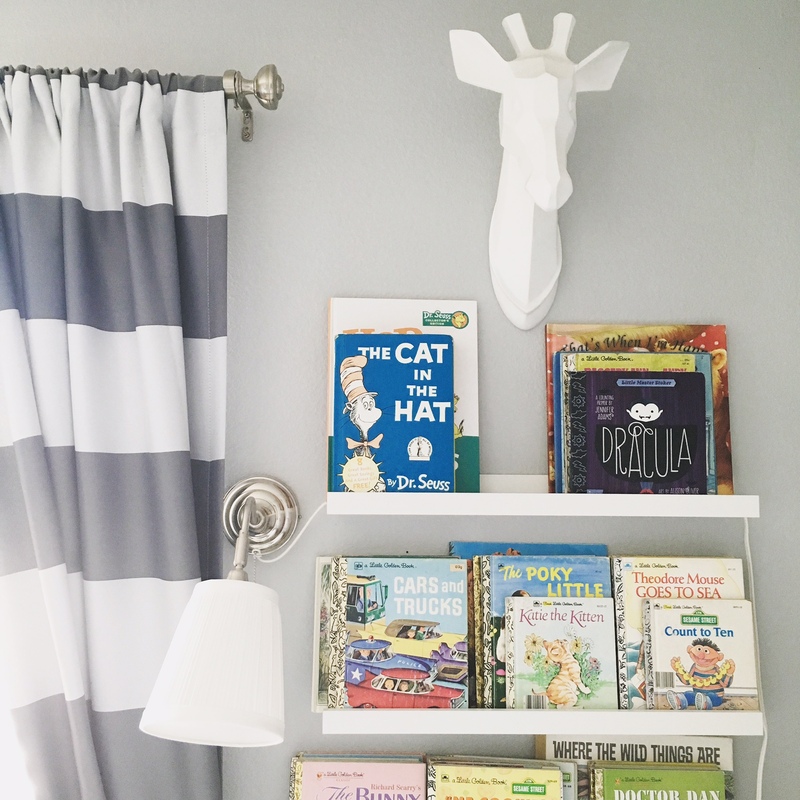 We all strive as mamas and decorators to maintain that decluttered and designed look even in our kids’ rooms, but we don’t always have the budget for it! 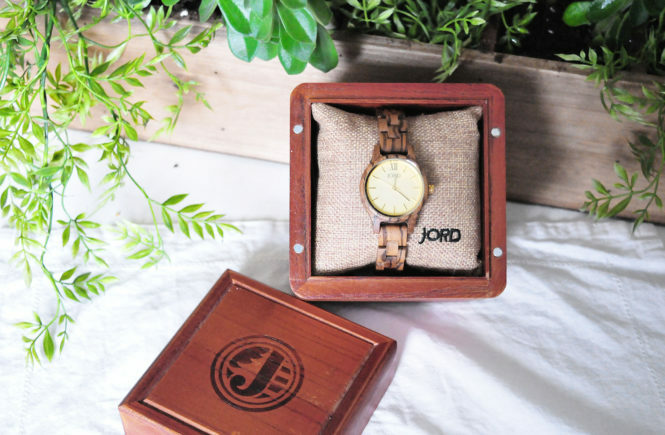 Thankfully, there are sales and closeouts, consignments and, of course, DIYs as well as some incredibly talented and creative bloggers who are willing to share tidbits of their expertise. Today, we are blessed to have Ashley stopping by from At Home With Ashley to share her Top 5 List for decorating a nursery on a budget. Prepare yourselves. She’s amazing! 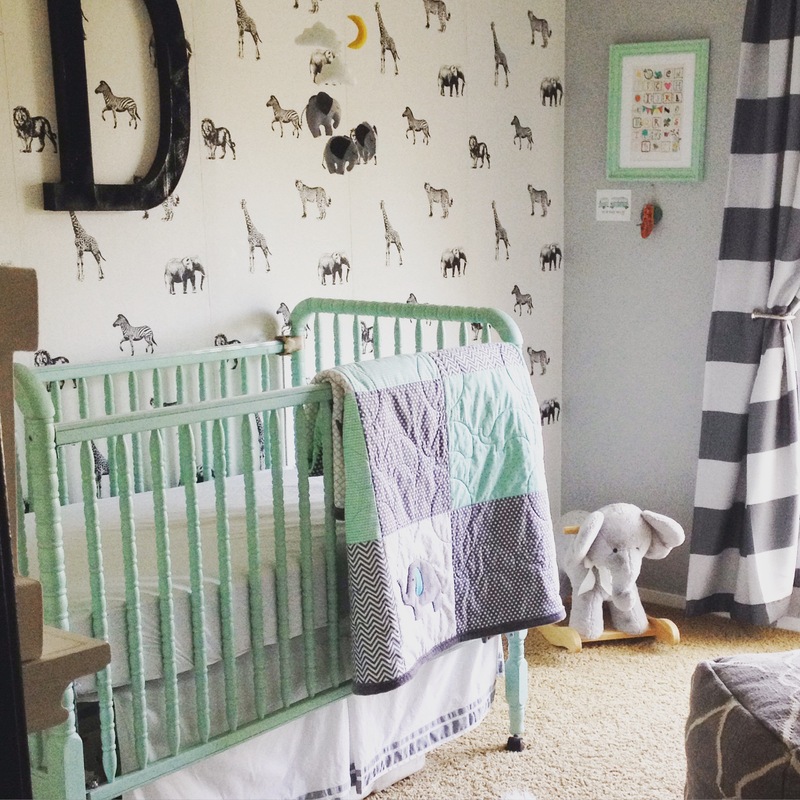 Thanks, Amanda and Jessica, for letting me stop by and post on one of my favorite subjects — how to decorate a nursery on a budget. I am Ashley from At Home With Ashley, and I specialize in decorating with personality for less. 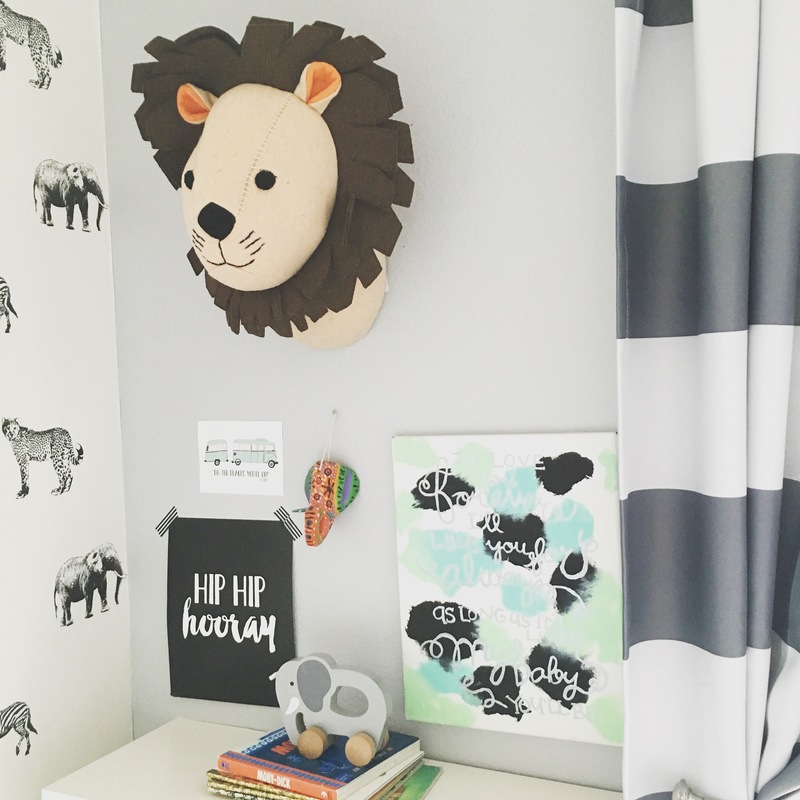 A kid room is the perfect excuse to have fun and be more bold than you normally would be. For my son’s room we went with a safari themed wallpaper (available here for $50) that really pulled the room together. 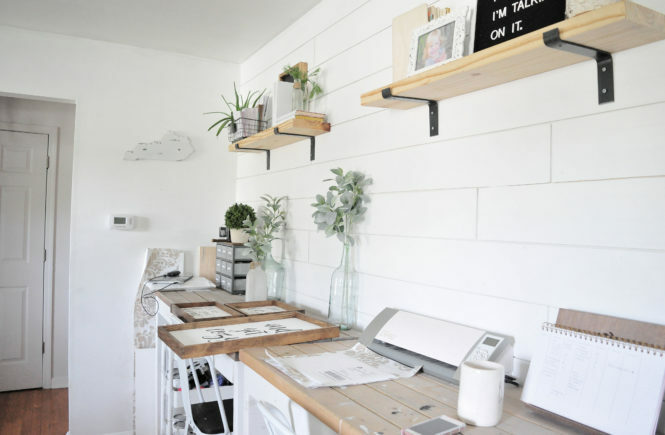 I think spending between $50-$75 on a statement wall can give you the look you want and not break the bank. 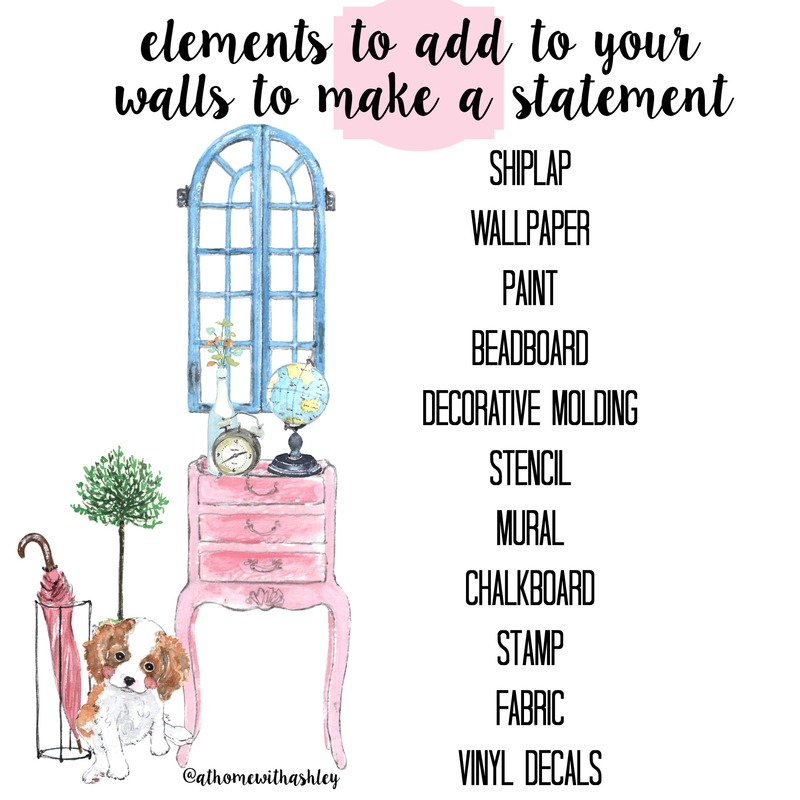 Below are some other ideas for statement walls. 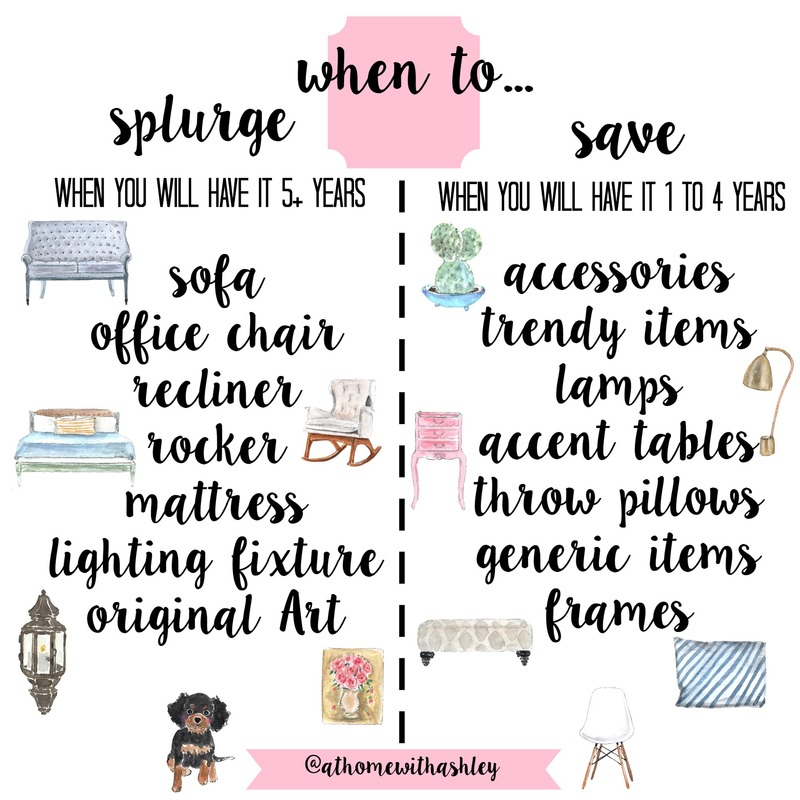 There are times to splurge and times to save and below are my guidelines on when to do each. As you can see, I think a chair is the time to splurge. 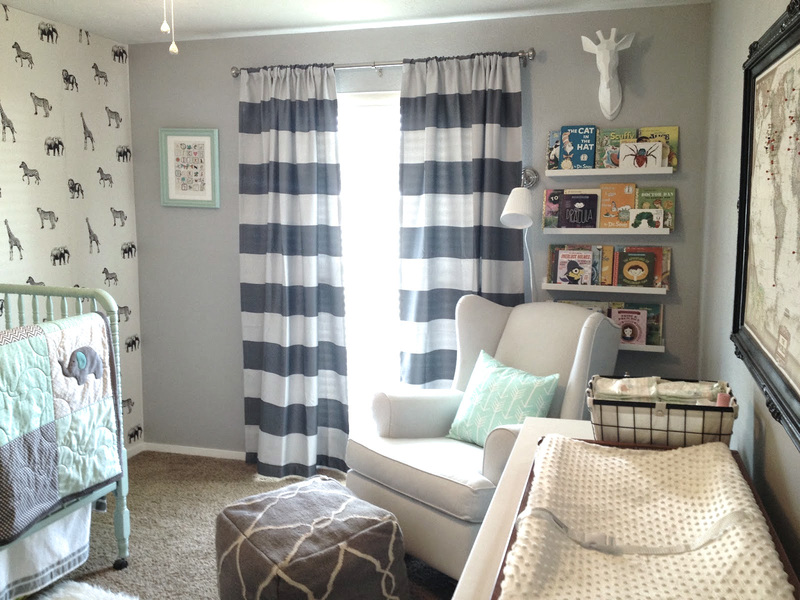 A nursery really needs a comfy chair for all of the rocking and feeding done in those early months and reading books later. I like to budget $400 for a nice rocker or glider and get something that you can spend lots of time in (because believe me, you will!). If you get a neutral option, you can move the chair into a living room later and did you know that rockers can be changed into regular chairs with just switching out the legs? Knowing those things helped me feel better about my investment. I got my rocker on sale at a local store that resells Pottery Barn returns (Down East Home) and have found some great options on Wayfair as well. 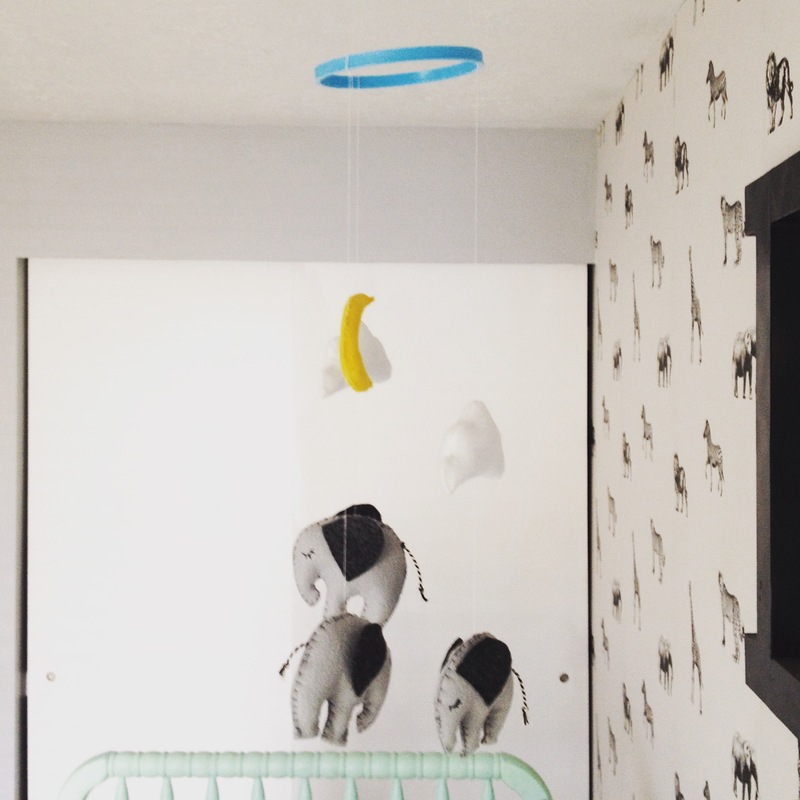 Nothing says baby room like a mobile. This is a great time to bring in a whimsical element to the room. For my son’s nursery I hunted everywhere for the perfect elephant mobile to match the safari theme, but couldn’t find anything! I decided to DIY my own and ended up making one out of felt that I loved for less than $5! If you would like the directions and free pattern, click here. I believe in the importance of reading even to a baby (any excuse for more snuggle time, am I right?!). When I was nesting I would head to my local thrift store and buy Golden books for $0.50. I built up a great collection, but I needed a place to put them. Ikea to the rescue! I used their $10 picture ledge option and like that the books act as art. I added a giraffe head (no longer available) and love my little reading corner. I am a believer in affordable art! First of all, search Pinterest for free printables. You won’t believe the variety you will find! That is where I found my “be brave” art (Be Brave). Or search Etsy for printables. I have had the best luck there and have lots of prints I love that were $1-$5! (Hip hip horray print). If you need a frame for your print, just buy one from the thrift store and paint! 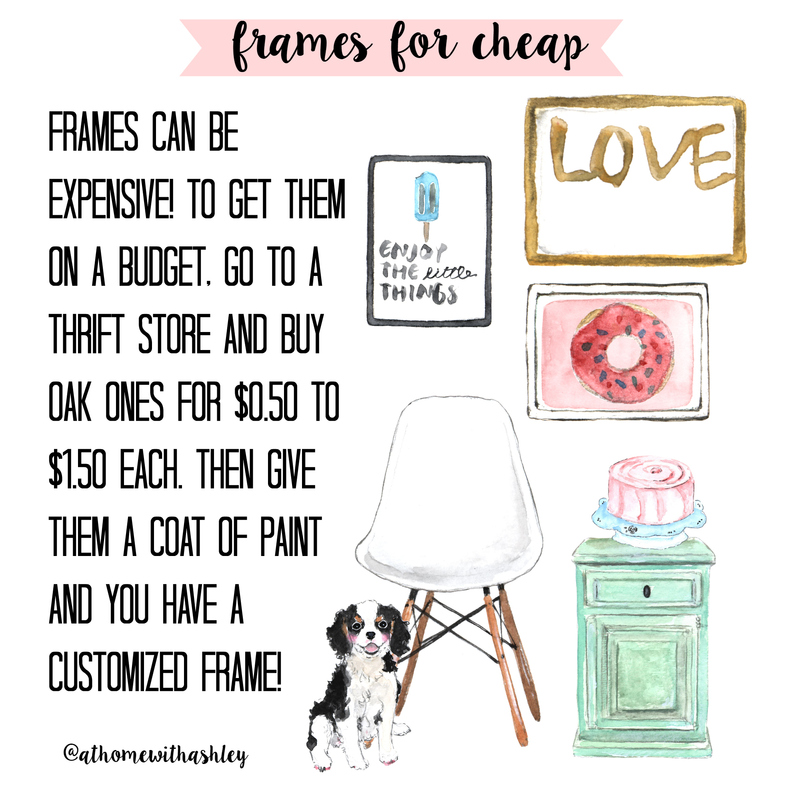 These frames are usually $0.50-$1.00 which is much more affordable than the usual $8-$10 from Micheal’s or Ikea. When my baby was around 9 months old, we DIY’d the mint, blue and black art together. It makes me sentimental that we collaborated on a project when he was so little. I took a canvas and put blobs of paint on top and covered it with plastic wrap and let him smoosh the paint around. I loved that it was a mess free project! I then took the wrap off, let dry, and painted a quote on top (here’s the full post with instructions for more details). A huge thanks to Ashley for sharing with us today! 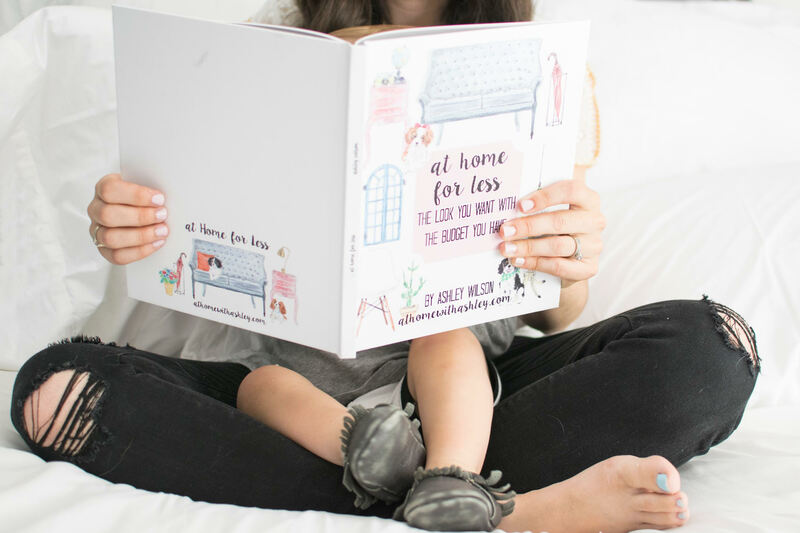 Be sure to check out her site and follow her on Facebook, Instagram and Pinterest, and don’t forget to snag your copy of At Home for Less! It is a must-read!